Almost there...in more ways than one! What a fabulous art week we have all just had at Higham Hall sharing mixed media art techniques on a recent art break in the heart of the Western Fells near Keswick in the Lake District. I came back on Monday 6 July just buzzing with ideas and inspired and I know everyone else has too! 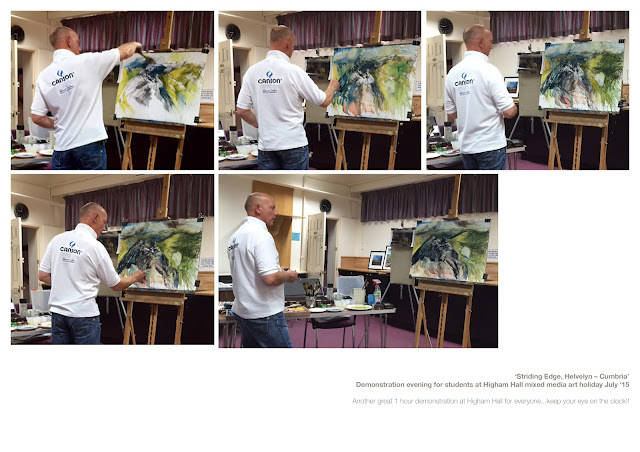 'Robert, I was really inspired by your art, teaching, energy and enthusiasm! I admired the way your work was an externalisation of your love for the landscape and environment, underpinned by true understanding, knowledge, skill and bags of talent! I have learnt so much from you, though I think I am still processing most of it. Here is another great evening demonstration for everyone well underway! It is of 'Striding Edge' on 'Helvelyn' in The Lake District - created on Canson Moulin du Roy 300gsm (140lb) 'not' 100% cotton watercolour paper. A really exciting mixed media painting to do in 1hr! Canson Moulin du Roy 300gsm (140lb) 'not' is one of my favourite all time papers and no...that's not just because I'm wearing the logo! I'm proud to fly the flag for Canson - a winning result every time on these very special and unique surface papers. All my students just love Canson papers too - especially the Canson Mi-Teintes 'Touch' 350gsm pastel paper. With 10 different great colours to choose from to create superb pastel paintings on them, who wouldn't! Here is the painting as I left it to bring back to my studio in Leeds (sadly leaving the Lake District behind) but I'll be back to Higham Hall in the Autumn. You'll just have to 'watch this space' to see what I do with it next! Next art break at Higham is planned for 1-6 November '15. Thanks to David Robson from Newcastle who came on the mixed media art week for sending through the photos of this demonstration - Davids' sketchbook work was amazing! Such great draftsmanship shown on every page! New art techniques to add to to your drawing skills now David! Bring your new work with you next time, I'm really looking forward to seeing those David!